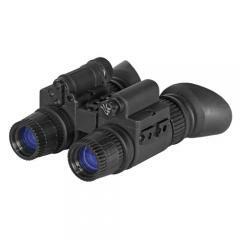 ATN NVGOPS1530 PS15-3 Night Vision Goggles FREE SHIPPING! Conduct 24-hour surveillance and navigate pitch black terrains with confidence using the PS15-3 Night Vision Goggles from ATN. Featuring precision-cut optics and dual-image intensifier tubes, the PS15-3 is one of the most versatile and dependable night vision goggles on the market. Multi-coated glass lenses allow for maximum light transference so that the powerful internal processors can convert ambient light rays into a crystal clear image. With two tubes instead of one, the goggles offer improved depth perception for greater mobility and tactical functionality while in the field. A built-in infrared illuminator is ideal for reading maps and moving through dark environments. Equipped with a multi-function, comfort-fit headset, the goggles allow for total hands-free operation, letting users wield pistols and function in the dark as easily as if it were day. A ruggedized construction provides the waterproof and impact-resistant durability needed to handle the toughest missions and stand up to the most intense environmental conditions. ©2002-2019 CopsPlus.com: ATN NVGOPS1530 PS15-3 Night Vision Goggles FREE SHIPPING!